‘The anti-copyright case is very seductive and populist. The pro-copyright message is much more difficult to make,’ observed Mark Bide. He was speaking in the rights and licensing session of the recent ALPSP conference. Bide is involved in several projects to attempt to achieve this. One of these is ACAP, which aims to describe electronic rights in ways that they can be interpreted automatically by search engines and web crawlers. Another project is EDItEUR, which is involved in developing the ONIX-PL standard for communicating publishers’ licences to libraries. So why are rights important? Jenny Pickles, associate director of global rights at John Wiley & Sons, told delegates that publishers are not ‘gatekeepers stopping people from accessing content’. However, their role is ‘not just to increase access to authors’ work but to increase revenue to them’. She observed that the complexities of rights management mean that publishers are increasingly turning to third parties such as iCopyright and Copyright Clearance Center. ‘Sometimes rights and licensing becomes the “nice to have” department within a company,’ she noted. Outsourcing this allows publishers to focus on more difficult and interesting electronic licensing models and helps publishers to monetise content that might currently be being used illegally. With so many complex issues involved, we asked some experts in this area for their insight into rights and licences. Publishing digital content means that there are always new licensing issues to think about. We publish subscription, hybrid and fully openaccess (OA) titles. Our licence to publish (granting NPG an exclusive right to publish) is compliant with all funder requirements regarding self-archiving of which we are aware. Reuse of the published version remains subject to permission, but, working with Wellcome Trust and NCBI, we have recently clarified terms for reuse of archived manuscripts, expressly allowing the downloading of manuscripts for text-mining experiments. On hybrid journals, where authors choose to pay, we provide Creative Commons licences, and we let the authors decide whether to permit derivatives. This is a significant issue. Some funders will only fund open-access fees if derivatives are permitted, but we think that this issue needs careful consideration. Our discussions with academics reveal that there is general concern about attribution. If you are text mining a thousand articles, for example, you’ll never give attribution to all of them. It is unfortunate that the Creative Commons licence either allows all derivatives or none. It might be better if authors could allow certain types of derivatives and exclude others. More discussion and qualification would be useful. Because copyright legislation is national and universities and funders tend to be grouped nationally there are ongoing problems between a market that thinks nationally and publishers that think globally. It can make rights discussions limited and somewhat frustrating. 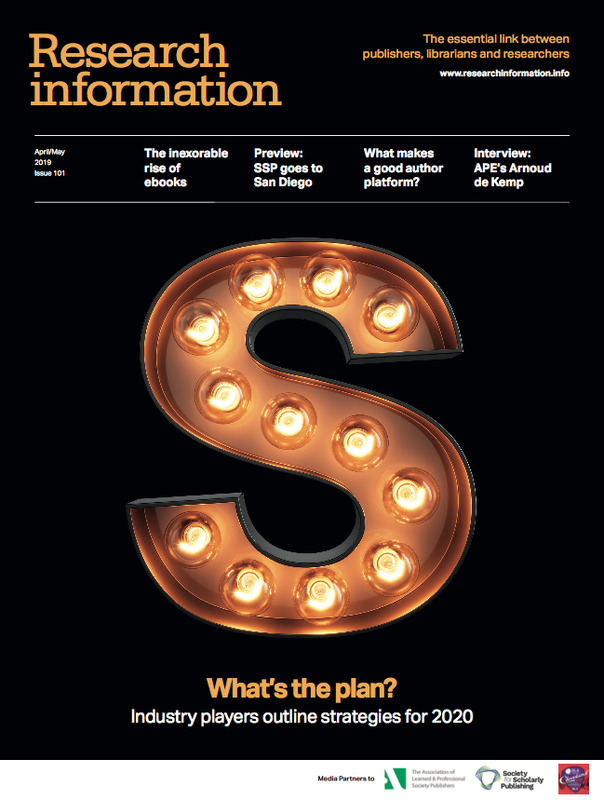 When I started as a consultant in 1998 the subscription agents were very concerned that huge numbers of different licences were being created and they wanted some models to help simplify things. We had to take legal advice about whether this would conflict with competition regulation and were told that we could work together to create model licences as long as they were pre-competitive. The model licences include a number of options. For example, inter-library loans could be permitted, not permitted or permitted but only for print. We are trying to bring some predictability into the process. It is entirely up to publishers which licence they use. The model licences contain all the language they could need to describe their licences. They were first created in 1999 and revised in 2001. Among other things, the latest 2009 update adds e-book licences. We also include use in text mining and collaborative tools. This latest iteration has been done with Trisha Davies, a librarian at Ohio State University and an expert on licensing. What was surprising was how little needed revising considering the electronic developments that have happened. The licence is the end result of licence negotiations so, in a way, is the least important bit. People make too much of a meal of it, especially in the USA where legal departments scrutinise everything. Most of a contract of this type contains provision for what could go wrong. That’s why they seem very long to a non-lawyer. I would like to get to the stage where we don’t need them because the approaches contained in the licences become standard practice. There has been some progress with the Shared Electronic Resources Understanding (SERU) standard for individual subscribers. This has some way to go though but it would be sensible because so few of the uses discussed are going to get into disputes that end up going to court. We are not a litigious community. Licences are important because they clarify what we can and cannot do with information. Every publisher is different. There are still some people who, if they don’t understand what users want or will do, will just say ‘no’ to uses. Small learned society publishers tend to be much more restrictive. We are going to have the same sorts of discussions and disputes with e-books as we have with journals. People talk about e-books but they don’t agree what they are and different types of books are much more different from each other than journals. When it comes to rights management of mass media you basically have two choices: do nothing, or automate it. You cannot expect to reproduce the manual processes of licensing and rights management in the networked world. Instead you have to be able to express the permissions attached to your content in a machine readable form. There is plenty of evidence that people want to be compliant. Newspapers, for example, have never had such wide readerships but the network has separated their readership from the revenue. The problem is not that the copyright system is broken, but that the tools are broken. The key is to take the people out of the transactions so that the transaction costs are small. We have started with how the publishers of content talk to search engines, which needs a rights layer built into it. You could ultimately be talking about a rights layer in the browser but, at the moment, it is about getting the crawlers to recognise the rights on content and to control how it is used. I have been in the publishing industry for many years and I have never seen the whole publishing industry come together so quickly in a single project as it has done with ACAP. It started with newspapers but it has now spread to all forms of publishing as well as other media. There is an understanding that individual media cannot come up with an individual means of control. We all have to work together. Audio visual (AV) content on a newspaper website needs to be handled like AV in other sectors. So far we have not been able to get any of the major search engines to implement ACAP, but there are about 1,600 newspaper servers implementing ACAP including some very big brands. If people have been effectively ignoring intellectual property for 15 years and then the copyright owners start re-asserting their rights they are not going to find it very easy to comply. But we need to see this happen and a recognition that copyright has not gone away. And of course it has a political dimension. Copyright contributes a significant amount to the GDP of many countries and if those countries want their economies to continue to grow then they have to make sure that the copyright system works. Liam Earney is collections team manager for JISC Collections with responsibility for much of JISC Collections licensing and negotiations with publishers on behalf of universities, colleges and research councils in the UK. He has also previously worked on JISC projects investigating issues surrounding the management and clearance of third party rights. Institutions face several issues:. Firstly, there are too many licences – and more to come. JISC Collections has doubled the number of licence agreements that it negotiates in the last four years, and that number is likely to grow further. In addition, institutions have licences that they have negotiated locally. Especially with e-journal and e-book agreements, there is an administrative burden involved in processing these agreements because they are complex. Increasingly senior staff are finding their time taken up with licensing – a cost I suspect is often overlooked. As more institutions transition from print collections to online collections, especially with the take up of e-books, the number of licences that they sign up to or negotiate, process and manage increases as well. Secondly, there is too much inconsistency, opacity and legalese. Not only are there a large number of licences to manage, but they are all different. Even when one is working from a model licence like JISC’s there may be variations on a licence-by-licence basis that come about through the negotiating process. It is also an unfortunate truth that sometimes, in order to conclude negotiations, both sides will agree to wording that satisfies legal counsels more than it does proponents of plain English. This makes licences difficult to interpret, even for experienced librarians, and hard to explain to users. This is itself a problem since making sure that users comply with the licence is often one of the responsibilities of librarians. The multiplicity of licences’ inconsistent terms makes it hard to take full advantage of licence terms that have been granted. Since libraries are working to ensure that they don’t breach their licences, there is a lowest common denominator effect where the libraries are only comfortable promoting the most restricted set of uses to their users. This is particularly frustrating for an organisation like JISC Collections that is always seeking to innovate in the licences that it drafts so that they are better able to meet the needs of institutions and their users. It is also impossible to compare licence terms across resources because licences are still in non-machine readable formats. As institutions manage an increasingly diverse user base, with contacts in, for example, local colleges, schools and hospitals, it is important that they know who is allowed access to what and what they can do with it. At present this is almost impossible to do easily since the licences aren’t searchable in this way. When libraries subscribe to electronic resources directly, licences may not be consistent. JISC Collections tries to make sure that it remains as close to its model licence as possible and our licensing team resists making changes to the model licence wherever it can. JISC ran a recent project named RELi (Registry of Electronic Licences) to look at building a registry of licences in an electronic format that could then be queried and searched by institutions, and even associated with individual resources (such as a journal article) at the point of use. However, it faced a huge challenge because there aren’t many encodings of licences in an e-format. Electronic resource management (ERM) systems do provide mechanisms for communicating licence terms electronically. My concern is that they only provide for a sub-set of licence terms, rather than the full expression of a licence. They also require manual work on the part of librarians to input the data. In any case, only a minority of institutions have ERMs and therefore this wouldn’t really be a sector-wide solution even if the ERMs handled licences more effectively. The main standard that is drawing a lot of interest in the academic library/scholarly publishing environment is the ONIX for Publications Licence (ONIX-PL) from EDItEUR. ONIX-PL is part of the ONIX for Licensing Terms family of XML formats for the communication of licensing terms. 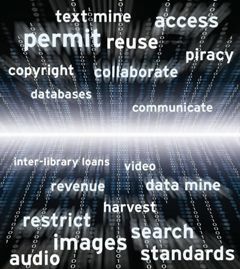 By allowing for the representation of any licence in a consistent XML format, and by allowing for the full expression of that licence – as well as annotation of licence terms – ONIX-PL offers a real opportunity for dealing with issues surrounding the management, interrogation and communication of multiple licences by libraries and their users. It should be possible for the ONIX-PL expression of any licence to be associated with the relevant resource and for librarians to find out quickly and easily about different permissions, let end-users know and compare licence terms across resources. Furthermore, the fact that it is a standards-based approach to the issues means that there is an opportunity for widespread take up and implementation across all stakeholders. A potential benefit is that it will highlight both poor licensing, where the meaning isn’t clear, and overly restrictive licensing, where the terms of a licence are clearly beyond what an academic institution would normally expect. Hopefully this will improve the quality of licensing overall, but also make those of us who are doing licensing aware of the impact of licence terms on those who use the resources and have to interpret and implement the licences associated with them. It may also drive a standardisation in both the terminology used in licences and the interpretations associated with those terms. NISO and the Publishers Licensing Society have been very supportive of ONIX-PL. NISO’s ONIX-PL working group has representatives from publishers, industry organisations, academic consortia and systems vendors. What all sides really need now are the tools and technologies to be developed that allow licences in ONIX-PL to be used by libraries. Originally it was hoped that ERMs would be the channel through which this would be achieved, but so far they haven’t adopted the standard. They cite a lack of demand as the reason, but I don’t know of a single consortia that isn’t keen to see the standard adopted, and many, including our own have included it as a criterion within tenders for such systems. One of the main recommendations of the JISC national e-books observatory project was that licensing needed to be simplified. As a result, JISC Collections and the Publishers Association are putting together a working group of publishers and librarians to develop a new model licence for e-books. As institutions seek to do more with content, such as Open Educational Resources, and publishers develop more innovative ways of delivering and interacting with content, their ability to license and manage rights will have to keep up and remain just as innovative. Currently, I am concerned that too much of peoples’ time is being spent on licences. They argue over words that may ultimately make no difference, and terms that have been inserted into licences for no benefit. We need to work on that, because ONIX-PL won’t suddenly make bad licences any more understandable; it will just highlight how bad they are. Approaches such as Shared Electronic Resources Understanding (SERU) hope to take licences out of the equation completely for very low-cost resources where all sides share a common understanding of what can and can’t be done with electronic resources and the responsibilities of both publishers and libraries. Libraries will become much more aware of the need to prioritise the time they spend on licensing and less willing to spend time on comparatively low value resources. Institutions will also increasingly view licensing as an activity that can be outsourced to third parties. After all, why should multiple institutions spend time negotiating almost the same licence for the same resources? That is exactly the sort of duplication of effort that should be removed from the system wherever it is appropriate and in the best interests of all institutions to do so.